Nikon has this morning ended rampant online speculation by confirming the imminent arrival of the D5300, a 24.2-million-pixel u2018entry-levelu2019 DSLR aimed at u2018aspiringu2019 photographers. Pitched above the D5200 (which will continue in the range), the D5300 uses a 39-point AF system with nine cross-type sensors in the centre. The D5300 will cost around £730, body-only, and is due on sale on 14 November. To help improve reproduction of subject detail, the camera’s imaging sensor does not have an optical low-pass filter – a move Nikon hopes will make the camera appeal to a broad range of photographers, not just its target audience – DSLR newcomers. manager Simon Iddon, speaking at the camera’s London press launch. would only say that it consists of a ‘special new material’. The D5300 is billed as the first DX-format DSLR to feature built-in Wi-Fi and GPS. It incorporates an Expeed 4 image processor and ISO of 12,800, extendable up to 25,600. Features also include a maximum claimed burst rate of five frames per second, and a 1,037k-dot, 3.2in, 170°-angle LCD screen (with brightness adjustment). The retouch menu now incorporates a new D-Lighting option for portrait work, while newly added creative effects include toy camera and an HDR painting option. The D5300 comes with a new, more energy efficient, battery – claimed to deliver 600 shots per charge (compared to 500 on the D5200). Earlier this month, AP reported that UK consumers have shifted their purchases towards lower specification, entry-level, models, according to market research firm GfK. 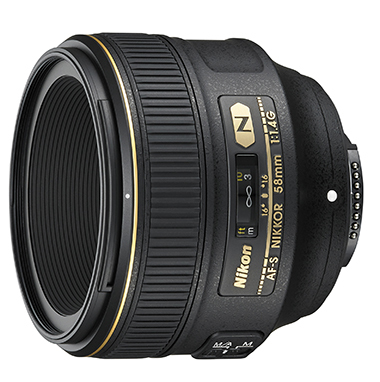 Also announced today is a new Nikon 58mm f/1.4G AF-S prime lens for FX-format DSLRs (pictured below). It will cost £1,599.99 and is due on sale on 31 October.